On January 15, 2009 I was sitting at my parent’s home in New Jersey watching the news. I’m a news junkie, and with my job I don’t get to watch as much of it as I would like. But on that day, I was prepping for my return to College (for my last semester) and had little to do but pack and watch some TV. I turned it on and within minutes there was a report that an airplane was down in the Hudson River. I knew that I would not be leaving that room anytime soon. I, like many others was glued to the television for what I knew was an unmitigated disaster. But as the story continued, I eventually saw the airplane sitting upright in the river, the rescue boats and eventually heard that everyone had survived. It was a miracle. Really, it was. In the months that followed we learned more about the crew of that airplane, their professionalism and their humility. 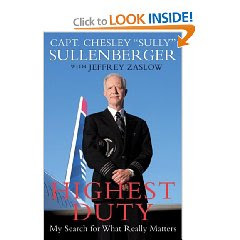 And so, when Captain Sullenberger (Captain of that airplane) published his book “Highest Duty”, I knew I had to read it. This book has been sitting on my desk for the last several months. My work schedule is not as conducive to reading as I would like but I get to it when I can. However, I read the first 100 pages in the first night. It continued like that since November, getting to the book when I could, but being completely engrossed in it when I did. Not since before College has this happened to me regarding a book. When combined with the essential lessons of, not just flying, but life that this book presents, this becomes a must-read for cadets, officers, pilots, and anyone with even a passing interest in aviation. Therefore, I have gladly added it to the list of “recommended reading” placed on the right-hand side of this blog. To be fair, though, the book is not written in the carefully crafted pros that I have become accustomed to in the last few years of my academia-filled life. Parts of the book tend to ramble. Parts jump all over the place. Poetry, this is not. However, these flaws are part of the books charm. This is the story of an everyman in extraordinary circumstances. Captain Sullenberger’s story is one I’ve heard and read for years from many different pilots old and young: the farmboy who discovered a love of aviation and learned to fly airplanes. This is also what makes his story so accessible. There are times where I feel like I know the man, or I’ve been in the same place at some point in my own journey, even those that have nothing to do with aviation. These life lessons are the ones that everyone should read. All of them have some connection to aviation or flying, but lessons like ‘Attention to Details’, ‘Hard work and Preparation pay off’ matter in all professions. Aviation here is like a game of baseball or football; an allegory that teaches a lesson in a safe, non-threatening manner. Pilots and aviation enthusiasts too will find more specific examples of the lessons learned after years spent on the flight deck. The importance of safety, checklists, procedures, knowledge of aircraft systems, and good decision-making are all laid out here in a way that easily hammer home these lessons as well. Perhaps my favorite chapter is Chapter 11, where Captain Sullenberger talks about the value of Crew Resource Management. Many a training scenario for us in the CAP and broader fields of aviation can come from this chapter alone. The Captain presents many different scenarios where other aircrews had to face extraordinary circumstances, and although their endings were not as joyful as his own, he lauds their accomplishments and airmanship through these difficulties. He also uses the opportunity to teach another lesson: there are times when the checklists don’t apply. When taken as a whole package, this is a must-read for everyone in the CAP, involved in aviation, or anyone looking for some good advice. The charm in this story lays in its universality. The lessons presented here are also universal. There are good times and bad, funny and serious alike. This is also a love story. Not just for family (which Captain Sullenberger clearly has a great deal of), but also of aviation. In the end, this story is the story of Life.